The majority of women notice weight gain as they get older. While much of this is due to natural aging, the menopausal changes that take place when a woman is in her forties and early fifties also contribute. Hormones and weight gain are inextricably - and unfortunately - linked; it's thought that as many as 90% of women approaching menopause gain extra pounds, typically around the stomach. Known commonly as “the middle-aged spread”, fat across the stomach may increase blood cholesterol, blood sugar, and the risk of heart problems, as well as creating self-confidence issues. To some extent, putting on weight is an inevitable part of aging. The natural slowing of the metabolism and loss of muscle tissue that occurs during middle age can cause extra pounds to creep on. During perimenopause however, the effect is often intensified because of the hormonal changes that take place in a woman's body during her forties and early fifties. The body decreases its hormone production in preparation for menopause, which affects the way fat is distributed around the body. 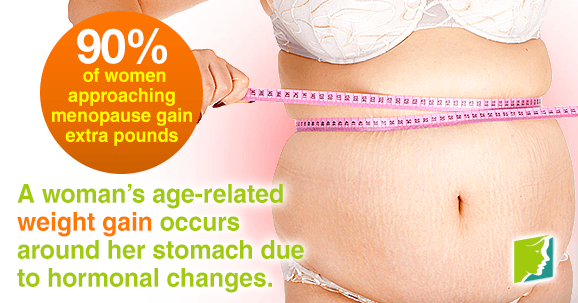 This means a woman's age-related weight gain usually occurs around her stomach. While women of child-bearing age tend to carry their weight in their hips and thighs (i.e., pear-shaped), older women carry it around their middle (i.e., apple-shaped). Not only can this be upsetting in terms of self-image, but excess fat around the stomach can also affect levels of cholesterol and sugar in the blood, which increases the risk of type 2 diabetes and coronary disease. For these reasons, it's important to control your weight by following a healthy diet with plenty of exercise. What you eat accounts for 80% of weight management. This may sound obvious, but following a healthy, balanced diet with plenty of protein, fiber, whole grains, and fresh fruit and vegetables will go a long way in preventing and addressing weight gain during menopause. With temptations around, this is often easier said than done; talking to a doctor may help to get you on the right track for maintaining a healthy weight. It can also help to develop habits that prevent overeating. Try drinking a glass of ice water before a meal to partially fill your stomach before eating; eat your meals slowly; and take a 15-minute pause after finishing a meal before reaching for seconds to allow your brain time to process the feeling of fullness first. Exercise is not only an effective way to control your weight - it is also a great way of combating many other menopause symptoms, such as mood swings. Try to incorporate 30 minutes of aerobic exercise - such as running, dancing, or swimming - into your routine, five days a week. The most effective form of exercise is always the one that you find most engaging, so choose an activity you enjoy and set realistic goals based on your lifestyle and fitness. The importance of tackling weight gain head-on during menopause is not to be underestimated, because this essentially means following a healthy diet and an active lifestyle. The benefits of eating and living well are numerous: decreased health risks, improved confidence, increased energy, and a reduction in other bothersome menopause symptoms - such as hot flashes and mood swings - can all occur as a result of healthy weight loss.